Unbeknownst to many, Google actually allows you to create your own web sites quickly and easily. Of all hosted content management sites, it’s probably the least customizable in terms of appearance; however, it’s also full of hosting and media-sharing features, and has the potential for great search engine results. 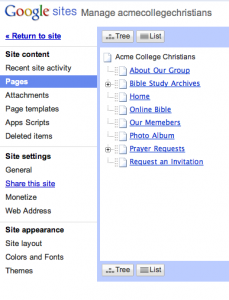 Google Sites uses an editing system and user account you’re used to using all around the Internet. It has more features built-in than many other hosted CMSes. When you first started, your first Google Site will have your Google username in the title (which is bad.) However, it seems this may no longer be the case. It has enough features that it can be hard to get started off. Although it can do a lot out of the box, there’s not a lot of room for upgrading beyond its abilities–unlike WordPress, there aren’t a lot of opportunities for users to create plugins. You already probably have a Google Account, so setting up your first Google Sites account is as easy as visiting sites.google.com and clicking the “Create new site” button. 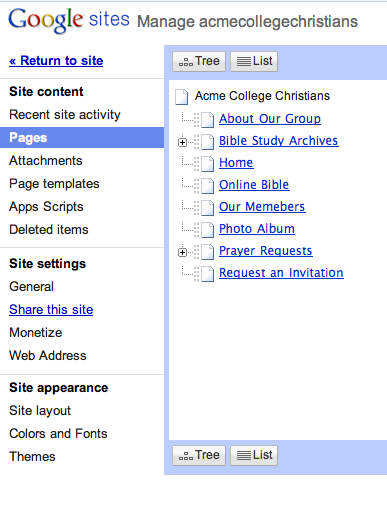 Choose your template (I chose “Bible Study” because it was too hard to turn down), name your site and choose your URL, and your site is online and ready to go. To edit a page, just click its link in the navigation menu on the left, and click the “Edit page” button on the upper right. You can also add new pages by clicking “New page”. In this menu bar, the most powerful option is the “Manage sites” page, which gives you the ability to manage your pages, edit attachments and templates, and change overall site settings. Each page can have a “template,” but you’ll want to get started with the “Web Page” template–just a plain page you can edit. There are many more options, settings, and places to edit the display and behavior of the site. This is just the tip of the iceberg, so go to town! I LOVE google sites. I use it for wikis and for my fellowship’s website. Unless you really want to be a webmaster, use google sites. You can also make the link color the same as the background color so there is less google info at the bottom of the site. The horizontal nav bar is a nice new feature.